Traditional serological pipets have a straight cylindrical shape vs. the Wobble-not, which has a two-tiered step design which helps to decrease insertion force, while increasing pipet stability in your controller. You will feel better, and work smarter. No more jamming your serological pipet into your pipet controller. Achieve maximum stability (no wobble) and LESS DRIPPING with our newest revolutionary design to benefit your health and wellness, as well as your research applications. Wobble-not = The First Ever Ergonomic Serological! With standard serological pipets, there has never been a difference in the plug end design. All require high insertion force (jamming) in an attempt to get the top as high up in the pipet controller nozzle as possible. You do this to try to get as much stability as possible otherwise, you risk dripping of the liquid you pipette. No matter how hard you jam, there is wobble. 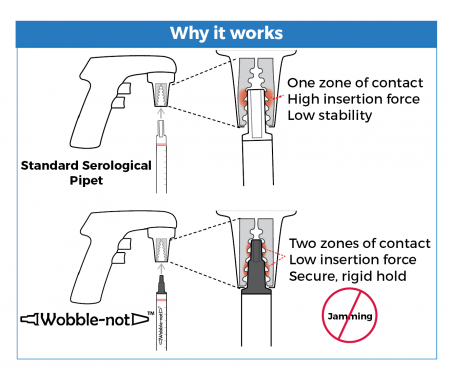 Wobble-not serological pipets are a revolutionary, new design and the only serological pipets that will give you two zones of contact with relatively low insertion force. No jamming! And furthermore, this results in maximum stability for your pipetting and LESS DRIP! No other serological pipet comes close to achieving the same amount of Wobble-not! Sorry, but currently only available in the U.S. and Canada. International customers, please contact your distributor to inquire about Wobble-not pipets. How did you hear about Wobble-not? What is the accuracy of the Wobble-not serological pipets? The accuracy is ± 2% at full volume. How are the Wobble-not serological pipets packaged? All Wobble-not serological pipets are individually paper/plastic wrapped, 200 pipets per case. 50 pipets in a bag with 4 bags per case for 10 mL Wobble-not pipets and 25 pipets in a bag with 8 bags per case for 25 mL Wobble-not pipets. Are Wobble-not serological pipets sterile? Yes. All Wobble-not serological pipets are sterilized to SAL 10-6. What is the Expiration Date on my Wobble-Not serological pipets? All VistaLab Technologies sterile disposables (Tips, Reagent Reservoirs, Wobble-Not serological pipets) are good for 3 years from the Date of Manufacture found on the Certificate of Analysis included in each case, or on each individual wrapper; as long as the packaging is unopened and uncompromised. Do Wobble-not serological pipets have a cotton plug? 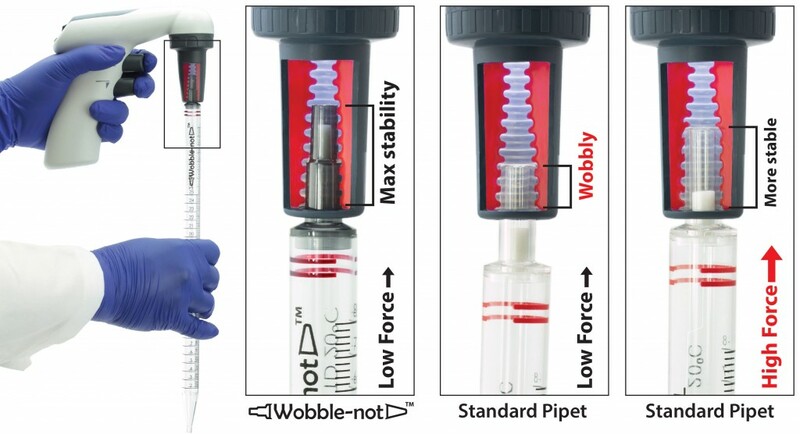 Wobble-not serological pipets have a porous polypropylene filter at the top plug end of the pipet. It is intended to prevent liquid or droplets from splashing up into the nozzle of the pipet controller. Can I get a Certificate of Compliance? Certificates of Compliance for each lot of Wobble-not serological pipets are currently available by contacting techservice@vistalab.com. Please have your lot # ready when requesting. To see a sample Certificate of Compliance with up to date quality conformity information, click here.